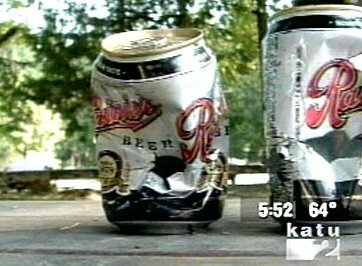 WAIST HIGH: "Black Bear Downs 36 Cans Of Beer Then Passes Out." A Story Destined For Waist High. "Black Bear Downs 36 Cans Of Beer Then Passes Out." A Story Destined For Waist High. (katu.com) BAKER LAKE, Wash. - When state Fish and Wildlife agents recently found a black bear passed out on the lawn of Baker Lake Resort, there were some clues scattered nearby - dozens of empty cans of Rainier Beer. "He drank the Rainier and wouldn't drink the Busch beer," said Lisa Broxson, bookkeeper at the campground and cabins resort east of Mount Baker. Fish and Wildlife enforcement Sgt. Bill Heinck said the bear did try one can of Busch, but ignored the rest. The beast then consumed about 36 cans of Rainier. Agents then used a large, humane trap to capture it for relocation, baiting the trap with the usual: doughnuts, honey and, in this case, two open cans of Rainier. That did the trick. "This is a new one on me," Heinck said. "I've known them to get into cans, but nothing like this. And it definitely had a preference."